Interoperability between XMPP and SIP protocols has become a necessity given that all closed and public Internet Services for Real Time Communications have migrated to a variant of these protocols, if not internally at least at their borders. Both protocols share a common feature-set, the most important one being the usage of Internet identifiers in the form of user@domain and replace the need for classic telephone numbers. Various projects in the open source domain emerged to tackle the interoperability between XMPP and SIP but all of them focused on one-to-one Presence signaling or VoIP sessions, but never in the context of rich media interoperability and using standard user@domain Internet addressing. 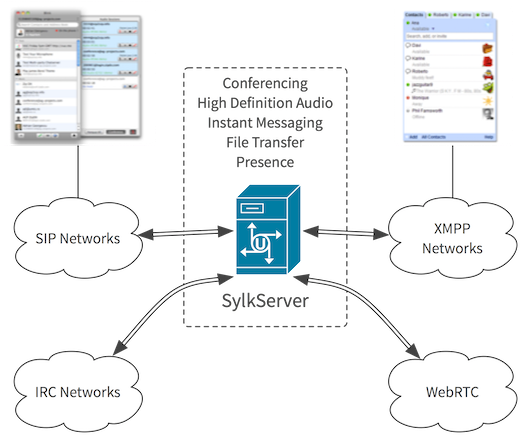 SylkServer SIP/XMPP gateway application goal is to cover this gap and provide an Open Source implementation for interoperability of all relevant media types and multimedia conferencing for them. We consider the following as relevant media: Wide-band audio, Session based IM, File Transfer, Presence and Multiparty Conferencing facilities for all of them. We consider Screensharing and Video beyond the basic need of interoperability due to obvious reasons related to codecs, scalability or lack of standards. The goal is to implement a bidirectional signaling and media gateway for Presence, Session based Instant Messaging, Multiparty Chat, Audio, and File Transfer for SIP and XMPP signaling protocols, RTP and MSRP media planes. This software will work with ZERO configuration, a simple command like "apt-get install sylkserver" will be enough for deployment of the gateway on a Debian Linux server. This research and development is part of the WormHole Project sponsored by NLNet and AG Projects. By pointing the correspondent DNS records for SIP or XMPP services of a given Internet domain to the address of this gateway, any packet sent to or connection established to the gateway by one of the protocols is transparently translated into the other. The server is designed in such way that it requires zero-configuration (except of course for the DNS domains configuration).